“Scream If You Want To Go Faster” was Russ Litten’s first novel, and maybe that’s what I should have done. It took me ages to read, and then far too long again to write a review. Which isn’t to say there’s a problem with the book. It’s a belter. But real life gets in the way. Necessity dictated reading a bit, putting it down, going back again and eventually wrapping it up after about four months. You can get away with dipping in and out of a book every now and then for a few months if it’s a dictionary, immaculately organised, everything precisely where it should be and the only surprises the handful of new words from the ever-evolving teenage and techno lexicons. The shifts between characters and locations provide a real test of concentration as Litten leaps from fairground bust-ups, to gripping urban taxi rides and the eerie activities of a manipulative and cynical clairvoyant. It took two sessions, which I count as a huge success and as a promise kept to the author. I found the same, page-turning qualities as “Scream”, story lines which are cleaner and easier to follow, enough profanities to remove it from grandma’s Christmas list options and to perhaps prompt a rethink of the title to “Swear Loads”, but that merely reflects the subject and the setting. Yet the author reveals that swearing is actually down compared with his previous work. Having written “Scream” about an environment, population and culture which he knows so well, Litten has ventured further afield for a second novel which is unconnected with the first in any meaningful way. Hull was at the heart of “Scream”, the place, the people and the folklore, from Hull Fair lighting up the cityscape to the floods of 2007, their inclusion in Litten’s book and thereby in the art and culture portfolio further cementing their place in history. In “Swear Down” Hull is something of a sub-plot, a bolt-hole for the two murder suspects. London coppers would never dream of looking for them in unfashionable Hull. Litten knows the bars and back streets of Hull with the familiarity of someone who was born and brought up here but who has also explored the place with the excited enthusiasm of a tourist and the determination and attention to detail of a tax man. While London’s sprawling, menacing tower block estates may be a different world, his scene-setting is strong enough to suggest similarly copious research into locations and lifestyles, citizens and stereotypes, distant dreams and brutal realities. 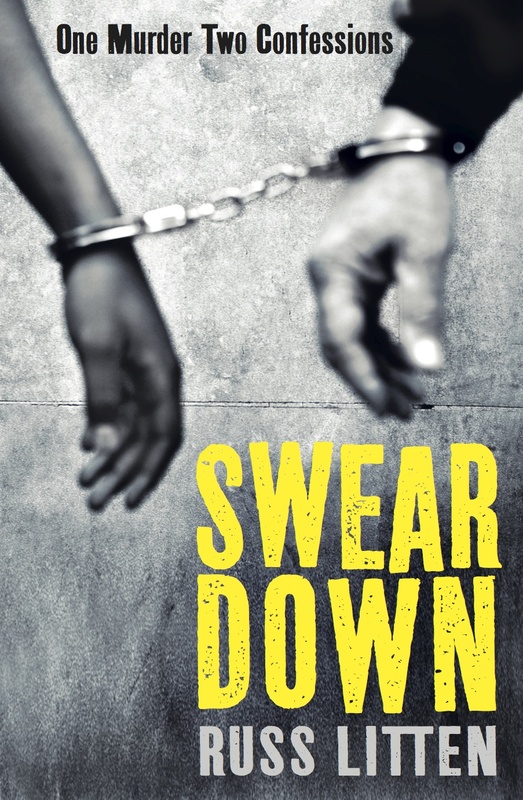 “Swear Down” feels for all the world like a four-part pilot to launch the career of a new TV detective whose style, manner, challenges and techniques not to mention his relationships in and out of work are an easy fit for prime time. But I need to read it again because while this is more of a “Who Didn’t Do It?” than “Whodunnit?” in reality there’s little difference; within a couple of days I honestly couldn’t remember who had struck the fatal blow. Not that it matters a great deal because both suspects clearly wished they had killed the small-time gangster who was terrorising the community. Both had motive and opportunity, and the lack of real hope for the future that fuels a disregard for the consequences of their actions. There’s the young lad from London who is bright, respectable and has a plan to escape from the local gangland and join his dad in the Caribbean. And the old boy from Hull who has been there, done it, sailed round the world, survived countless scrapes, offered more dubious advice than the young man could ever be interested in. Or maybe all both of them ever had were dreams. “Swear Down” is a compelling story, building tension and unleashing terror in action-packed but also occasionally hilarious fashion – a no-holds-barred scrap in the kitchen of an East London diner unfolds in the comedic style of Minder, Only Fools and Horses, Pulp Fiction. But the undercurrent is one of unease as Litten looks into the perceived worthlessness of young life and the desperation of people to cling to dreams of a distant wonderland rather than face up to the distressing downward spiral of the here and now reality.